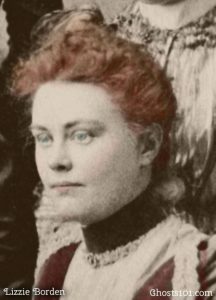 People have asked me why the Lizzie Borden house is still haunted, if — as many believe — Lizzie committed the crime. Isn’t the mystery solved? If Lizzie actually haunts the house now, I think she would stay even after the crime was solved. Everything that I’ve learned about her points to a quirky personality. She probably likes the attention. When I visited the Lizzie Borden house, I received very strong impressions. They’ve been confirmed by other psychics, and one Lizzie Borden historian. However, I’m not sure the house is actually haunted. Not by a ghost, anyway. When I was there, wiring-related EMF issues were a problem. I haven’t been back. Who committed the Lizzie Borden house murders? In my opinion, more than one person was involved in the murders. I believe that two were involved. If Lizzie had a clue what she and others were actually doing, I’m not sure she would have participated. That’s more a mental health issue than an absolution of what she may (or may not) have done. Also, I think several people went to considerable lengths to prevent Lizzie’s conviction. Close friends did their best to protect her. That may have included murder. For me, the most intense impressions came from the basement. Those below-ground rooms have a gruesome history. They could have inspired horror stories, even without the lurid murders upstairs. In addition, the basement has physical evidence best seen with Luminol (C8H7O3N3) or fluorescein and black light. It is not for the squeamish. Yes, there are logical explanations for that much blood. It’s also a great smokescreen for something more sinister. My psychic impressions included a maid, someone looking through a window, and a young person who appeared to be a man… but I’m not sure if that was just a disguise. If Lizzie haunts any one room, it’s probably the room nearest the front door. When you visit Lizzie’s famous house, sit on the sofa if you can. If you’re sensitive to psychic impressions, I think you’ll be impressed. Previous Previous post: How can I see a ghost? Next Next post: Was there really a Canterville ghost?